We are happy to announce that YouTrack 3.1 is released! We did our best to make a nice Christmas present for you and cheer you up! It’s been a while since the last YouTrack update, and this time we prepared a huge amount of great new features you definitely need to try. Check out what we’ve got for you this time! Keep focus and all details in one place. Getting lost in hundreds of duplicates? Now when you close an issue as duplicate, all its votes and watchers are automatically transferred to the main issue. And if you decide to unlink the duplicate issue, all its votes and watchers are transferred back to the original issue. Filtering duplicates with comments and attachments. Now you can filter all duplicates that contain comments or attachments right from the main issue. You can also see the number of issues with comments or attachments. Simply navigate to the Linked Issues tab, then click ‘with attachments’ or ‘with comments’ as appropriate to navigate straight to the issues you need (instead of browsing the whole list of duplicates). Need more than one Assignee or Build value? In YouTrack 3.1 you can change the existing custom field type from single value to multi values. This applies to Enumeration, Version, Build, User and Group custom field types. Changes history is now merged with the related comment. You can see all the changes made at the same time right below the comment. If you normally comment the changes you make, now it’s much easier to go through the comments along with the changes made. And that’s not all – attachments can now be added or previewed from comments as well. YouTrack’s search syntax now allows you to filter issues with a specific attribute, such as attachments, comments, links, or none of these. For example, enter: has: comments has: votes to find all issues that have comments and at least one vote. 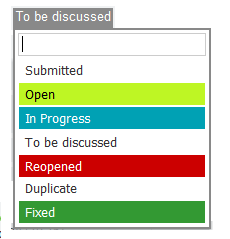 In YouTrack 3.1 you can attach as many files as you want to an issue or comment in one step, as well as paint your issue statuses with different colors. If you use mailbox integration, you’ve probably noticed that all messages with the same subject are collected in one thread and are added as comments to the issue created from the original email. Now these comments contain only the reply itself, without the original message text. One more addition concerns the visibility of issues created from email. 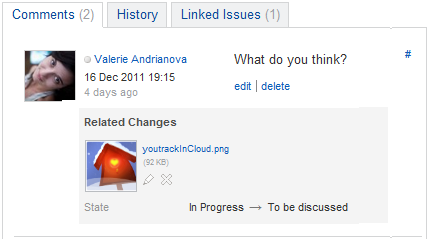 In YouTrack 3.1, a new issue is created from the reply if its author does not have access to the original issue. A custom workflow that allows you to specify the default user/group visibility for all new issues on project level. ‘Send test email’ option in now available while configuring e-mail notifications. Log in and restore your password using an email address. Multiple build configurations support in integration mapping. Choose whether to receive notifications on changes pulled from TeamCity, such as adding Fixed in Build values or any command applied. Find a tag by name, star/unstar issue for a specific user, create a new tag for a user. Use code completion for Group and Version. Perform string operations, including length, indexOf, contains, trim, split, etc. Check that collection contains an element. We extended YouTrack REST API by adding the ability to get issues history. Please check the Release Notes for more details. Download YouTrack 3.1 now or Sign up for YouTrack InCloud with the latest YouTrack version already available! By the way, YouTrack InCloud is free to use all winter! Wishing you a very Merry Christmas and a Happy New Year! Valerie Andrianova is YouTrack, Hub and Upsource Product Marketing Manager at JetBrains. Her professional interests include issue & bug tracking, project and task management, agile methodologies and team collaboration. Apart from work, she cannot imagine her life without live music, quirky books and lattes with those cute little foam hearts. This entry was posted in release and tagged update. Bookmark the permalink. Great!! I’ve really been waiting for some of these features! When will the YouTrackSharp library be updated to use the new History method ? I’ll update YouTrackSharp hopefully in this week for 3.1 support.